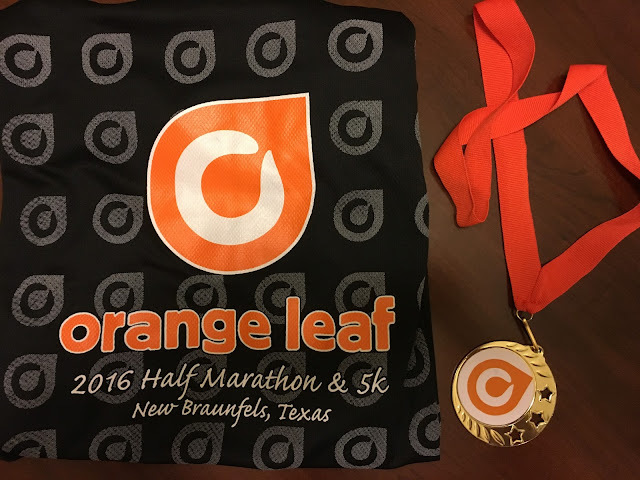 It's great when wishful plans comes together and this was the case with a last minute race Braden and I entered at the Orange Leaf 5K in New Braunfels, TX on July 16. Originally, my last race with Braden was going to be the Rock Run 8K back in May due to my deployment. I figured after that race, and my subsequent departure to Fort Hood, TX, it would be my last opportunity to see the family, much less race with Braden. 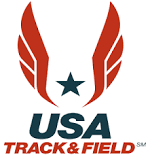 Fortunately, we received a four-day pass that worked perfectly within a tight window of me leaving and Braden leaving to Sacramento, CA for USATF Junior Olympics. When I was able to lock down on my pass window, I started to plan out a trip to San Antonio. I knew we would go to SeaWorld and the Alamo, but other than that I really wanted to take it easy and enjoy time with the family. I hadn't planned on any kind of running events...that is until a phone conversation I had with Braden. He asked if we could run a race, so I looked for anything in San Antonio and all I could find was a women's 5K. With the possibility of us striking out, he said we should just organize our own 5K race and invite others to run in our race! I laughed and told him it takes a little more organization for a race than what he was asking for. I wasn't about to give up though, so I expanded my search a little further out and found the Orange Leaf 5K about 30 minutes where we would be staying and signed us up. Needless to say, we were excited about the prospect of being able to run together again! It was the day before the race when they picked me up to head to San Antonio. When we got there we relaxed a little, went swimming, saw some sights and before we knew it was 9:30 p.m. and we needed to eat dinner. We had already had pasta for lunch and I was wanting some good Tex-Mex food, so we went to the River Walk for dinner and it turned out to be a big mistake. The food was great, but the ensuing heartburn I received the next morning was not good! I had to get us up at 5 a.m. for the drive and 7 a.m. start, so it was going to be a short night of rest. After receiving about 4 hours of sleep it was really hard getting up and my heartburn was raging, but we got gathered up to head to New Braunfels. Thankfully, it was overcast and in the high 80's at the start of the race, but it was still very humid and I knew with the tiredness and heartburn I wasn't going to be able to hang with Braden at all during the race. The flat course started at the Orange Leaf frozen yogurt shop and ran out and back through a shopping area and a country road that was adjacent. It was a weird kind of race since it combined a 5K and a Half Marathon, which started 30 minutes prior to our event. We set some very basic race goals...my goal was just to survive and I told Braden to just go out and have fun, try to place, and wait for me at the finish line. 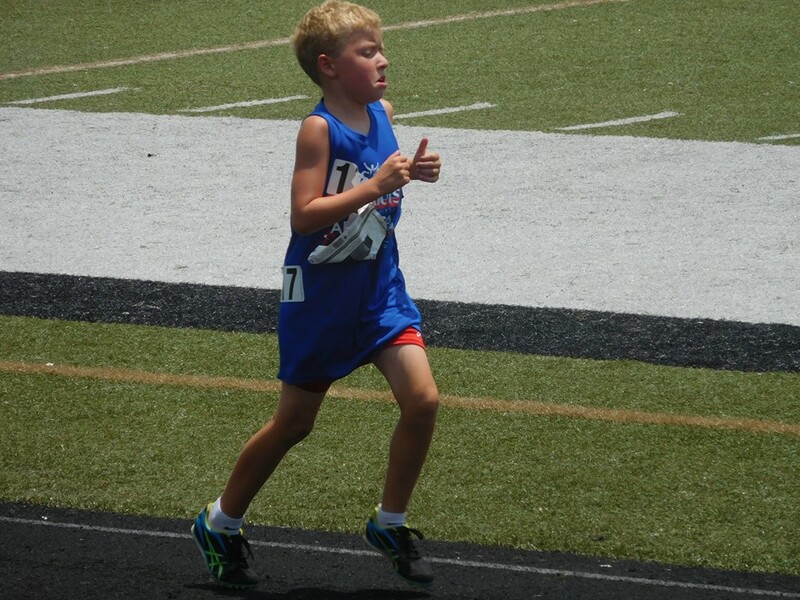 Normally, he is in the 0-9 age group, but for this particular race his age group was 0-14, which put him against older kids who would have a substantial edge over him. Braden started really well and before I knew it, he was already way ahead of me. He finished his first mile at a 7:40 pace and I didn't have any visual of him going into the second mile. As I neared the turnaround point, we passed each other and it looked like he was holding his own against the other kids, but it was hard seeing if some of the teenagers were below or above 14. He slowed up on the second mile as his pace came in at 8:28. I was suffering through my own bad race with my tired legs and flaming stomach and it was all I could do just to not stop and throw-up, but I trudged along towards the finish where Braden was waiting and encouraging me to finish strong. I finished with a bad, for me, time of 27:55 and Braden told me his time was 24:59, finishing his last 1.1 miles at an 8:19 pace. He was happy because he kicked my rear end and I was happy because he was able to finish in the top 3 in his age group finishing behind a 13 and 14-year-old! After the race, Orange Leaf had free frozen yogurt to cool off my melting body and we headed back to the hotel where I took a much needed nap! We had a lot of fun the rest of our time in San Antonio. Even though the days spent were long, it seemed our cumulative time spent together flew by too fast! I was just happy that we were able to spend any time together since a few months earlier I didn't think I would have the opportunity to be with them. As we said our goodbyes, I told Braden to keep running strong and I promised him I would get in better shape so when I get back I'll be able to hang with him better! Braden's next big event is the Javelin competition at Junior Olympic Nationals. Even though he doesn't really have a realistic shot of placing, I'm just hoping he could break a personal best and have a good time. 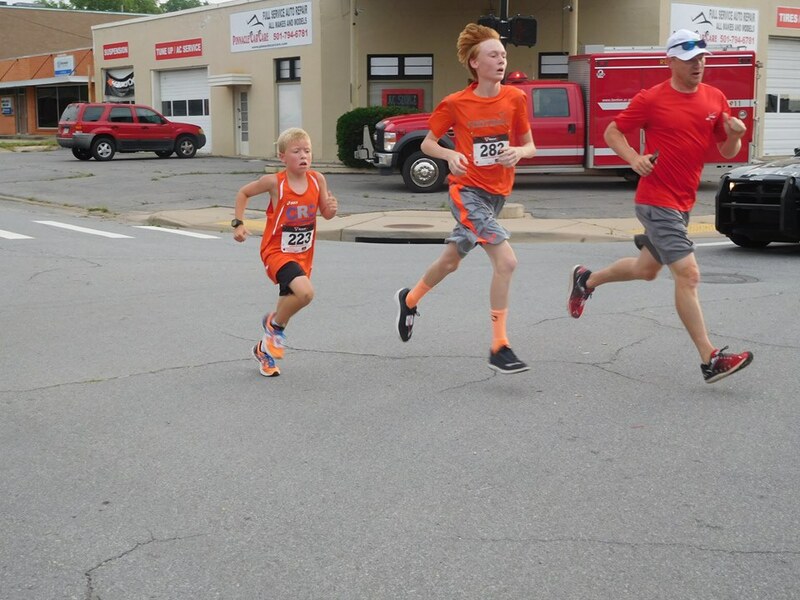 His next road race will be in a couple of weeks as the Grand Prix starts up again with a hot, hilly, and humid run at the White River 4 miler in Batesville. He hasn't ran this race before, but he is feeling confident because he's ran in the heat all summer long. One week after the Arkansas 2 Mile run, Braden was back at it again for the shortest Grand Prix race of the year…the Go! Mile one-mile run in Little Rock. Braden came in second place last year with a time of 7:30 and he was looking to be around the 7:00 mark this time around. He felt confident, but once again, his speed just wasn’t there. He said he felt decent, but the little hill towards the end kinda got him as he finished in second place with a time of 7:22 (losing first by 7 seconds). He set a new PR, it was quite a bit off from the time he was wanting and once again he was apathetic towards the result. Even though he came in second, he came in first amongst the Grand Prix runners, received all 30 points, and now has 230 points for the year. He now is only one non-championship race away from clinching first place overall for his age group for the year, with seven races remaining! 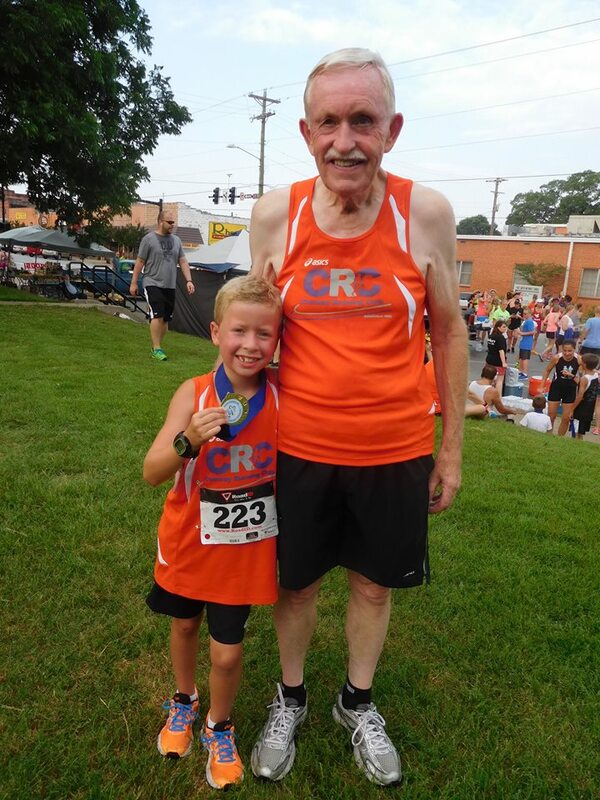 The really cool thing is that he is seven races away from also becoming an Iron Runner and completing all the races for his age group! I don't foresee anything that will keep from reaching the Iron Runner goal, other than a possible conflict with the last race of the year with a USATF Cross Country qualifying race. 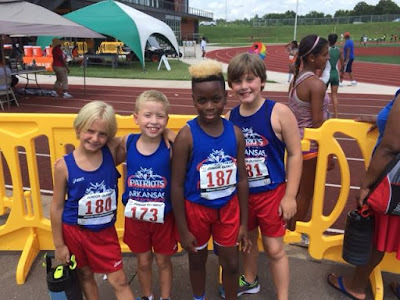 I may have to try to work a deal out with USATF Arkansas for a bye to Nationals, if that is all Braden is needing to pull off the tough accomplishment. The next week he had the Arkansas USATF Championships in Little Rock to qualify for Regionals in Joplin, MO. 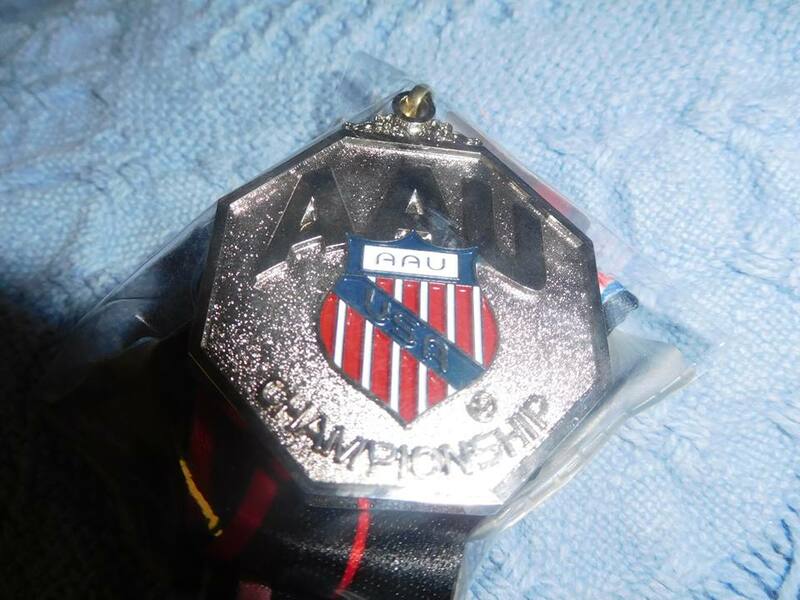 It was basically the first step to go to Nationals in Sacramento, CA late July. Braden has had a difficult time this summer improving upon the performances he had a year earlier and it really came to a breaking point with him over the past couple of months. 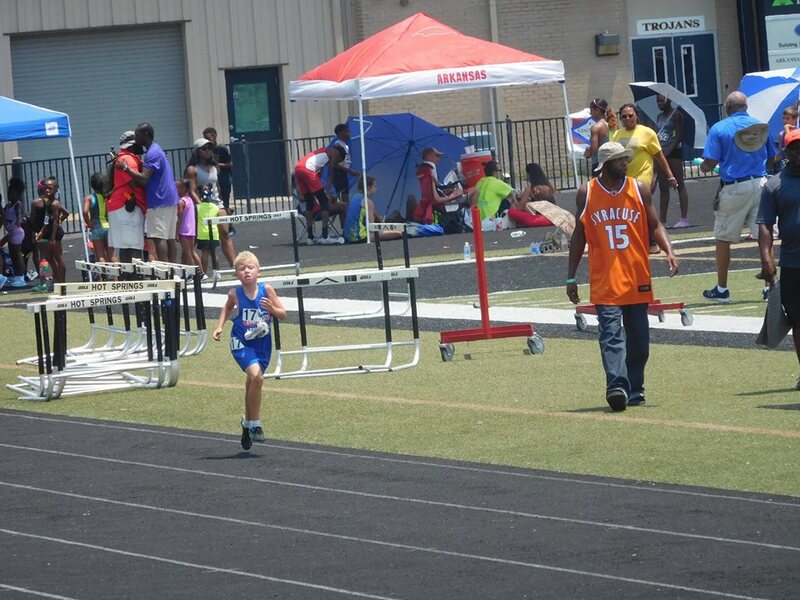 Like I mentioned in the previous blog, he ran slower than expected at his track meet. While most of the kid’s he keeps up with regionally have improved greatly since last year, Braden’s times have gotten worse. 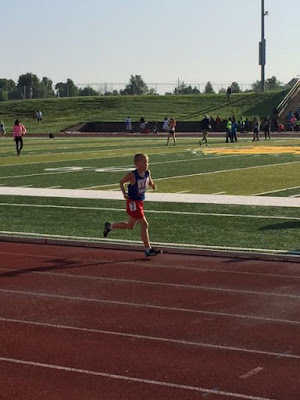 One night after track practice, I received a call from my frustrated little runner about his times and why was he running so much slower than the previous year. The only thing I could figure was that the heat was really getting to him, but I was also thinking it had to be something else because it was just as hot the previous year and he didn’t have any issues. At the USATF meet, he was slotted to throw the javelin and run in the 800M and 1500M. Apparently it was terribly hot and windy and it was reflected in his results. His first race out the gate was the 800M and he took first place with a time of 3:16.72, which was an improvement from the previous week, but still off from his PB the previous year. He then was ready for the javelin, and even though he didn’t throw it as far the previous week, he still came in first with a throw of 42-25 ft. in the windy conditions. Of course it probably didn't help that he got stung by a yellow jacket on his throwing arm, prior to the event...ouch! His last event was the 1500M and he did well against his competition finishing in first, but the downside was his time of 6:58.88, which was worse than the previous week and not even close to his times from last year (6:31). He took home three gold medals from the meet, but he knew his competition at the next level was going to be tougher and he was constantly getting frustrated with his times. The USATF Region 9 Championships in Joplin came two weeks later on July 9-10 and the competition did indeed prove to be tougher. The schedule looked favorable as he had his first race at 5 p.m. on Saturday, then he would run the 1500M on Sunday morning at 8 a.m. followed shortly thereafter with the javelin. Braden’s papa and nana Larson left early on Saturday to get to Joplin and received a call telling them that his 800M race got moved up to 3 p.m., so luckily they had left early enough to where it wasn’t an issue. Braden was up against 11 other runners and he took 8th place overall with a time of 3:15.80, which was his best time this season, but he didn’t qualify for Nationals because he had to finish in the top 5. I tried to encourage him for his race the following morning but he was feeling bad and not very confident. He actually said that he didn’t want to mess up by not qualifying and wasting the money we had already spent on plane tickets to Sacramento. I felt bad for him feeling the way he was, but I felt like he would be able to step up and qualify in the 1500M, since that was the race he qualified at last year after coming in 6th in the 800M and not qualifying. Sunday came and surprisingly he was running with seven other kids in his age group, which was by far the most he’s ran against in competition. Even though it was hot, it wasn’t nearly as bad as it had been due to the early start. Braden did a lot better than his previous meets with a time of 6:33, but it was still not as good as last year, as he came in 6th place and missed qualifying by 27 seconds. The kid who beat him by about 30 seconds last year, beat Braden by almost a minute this year. Braden’s coach even said he just doesn’t have the kick and drive like he did last year and can’t figure out what’s going on. He even thought that maybe me being gone and away from him is mentally messing with Braden's performance. Braden’s last shot at making Nationals took place immediately after the run as he headed to the javelin area. I was fortunate enough to get the play-by-play of his throws on the phone, but he was struggling to throw it as well as he had at previous meets, with his first five throws coming in just under 40 ft. In his last attempt he had his best throw of 41-01 which was good enough for 4th place and was enough to qualify him for Nationals! It's really weird that Braden is going to Nationals, but not in the capacity he’s wanting to go. I know he was wanting to be able to run, and seeing all the other runners out there participating while he is watching is going to tough for him, but at least he'll be able to participate in the javelin competition. I'm really excited about the next blog entry because it will be a special one with Braden’s next road race…stay tuned! 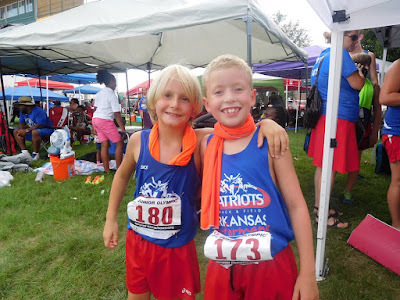 It’s been a long time since the last Running Down a Dream blog entry but it isn’t because Braden hasn’t been running…mainly it’s been because I’ve been swamped while at Fort Hood, TX. Luckily, all the races he’s ran have been short road races or track meets, so there won’t be a whole lot to talk about with race details. 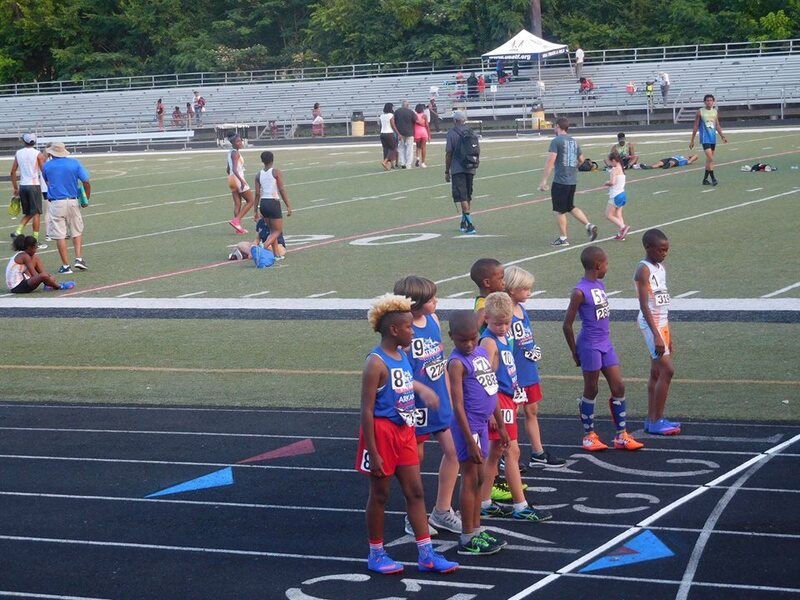 Braden’s first competitive day after I had left was a REALLY LONG one with a combination Grand Prix race and AAU track meet on June 11. His morning started at 7:30 a.m. with the Arkansas Runner 2 Mile race in Benton where the humidity was high and the course was hilly. Braden has set a PR a few months earlier at the Chase Race with a time of 14:51 and he wasn’t feeling his best at that run, so I had hoped despite the heat and the hills, his time wouldn’t be that far off. 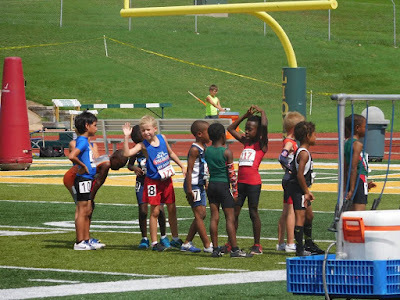 Braden had 13 other boys in his age group who were running against him, which made it one of the larger groups of kids he’s had to run against. He said he felt pretty good, and his first mile was reflective of that as he finished at a 7:15 pace but then the humidity and hills got to him and he finished his second mile at a 7:57 pace and a total time of 15:26. Even though he was a little disappointed with his time, he still finished in first place, which enable him to pick up all 20 points in the Grand Prix standings. 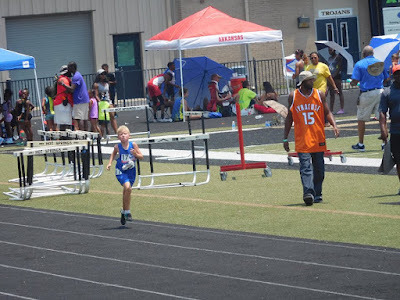 Normally he would stick around for the awards, but he had to hurry up to get to the AAU Arkansas District Qualifier in Hot Springs. By the time he got to Hot Springs, the temperatures were starting to rise and the AAU officials were running about two hours behind!! 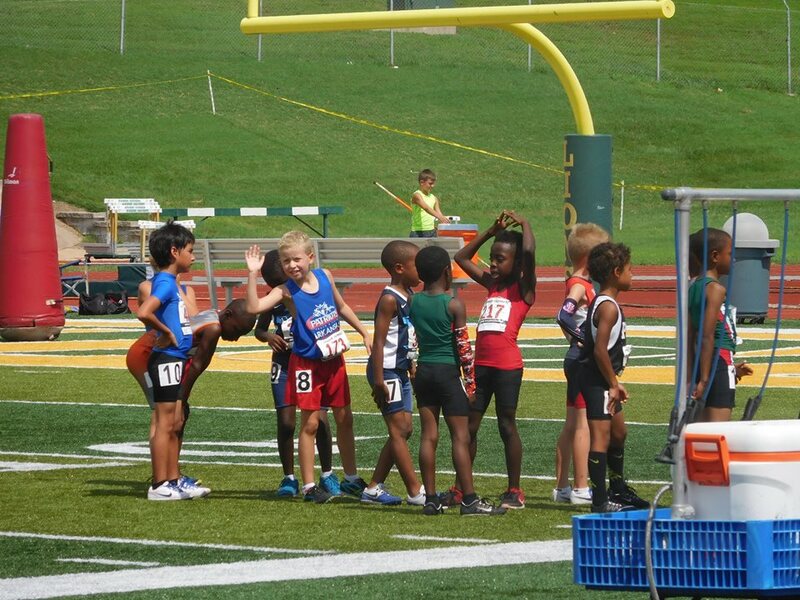 The poor kid had to wait in the heat for hours before his first race took place. 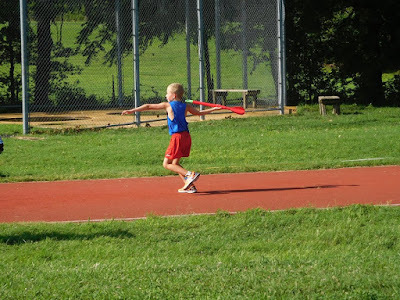 Braden’s first event was the javelin, which was the first time he had done a field event in competition. Prior to the beginning of the year, he had wanted to do something else to supplement his running and I figured the javelin was more up his alley. 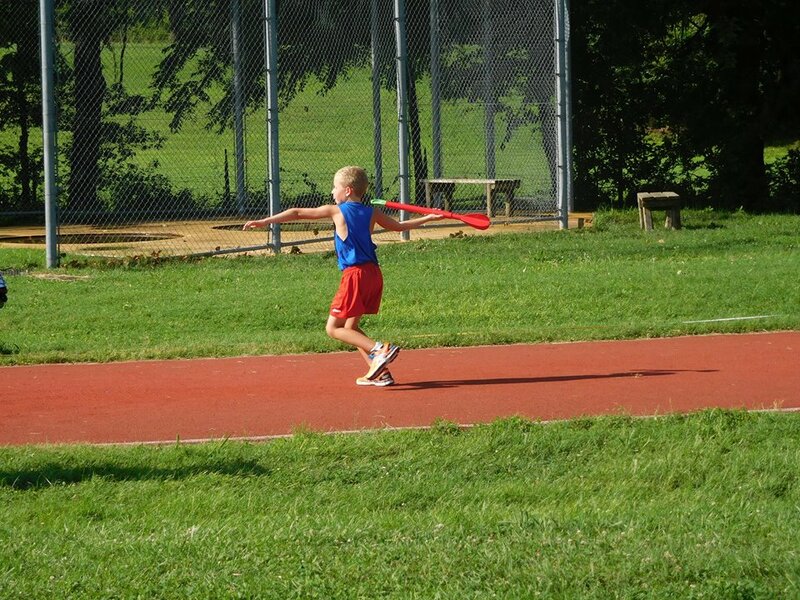 He did really well for his first time, coming in second place with a 47 ft. throw against five other kids. Because of the javelin competition happening at an adjacent field, Braden almost missed the start of the 1500M run. His race started at 1:00 p.m., which is a terrible time to have to start running long distance events! 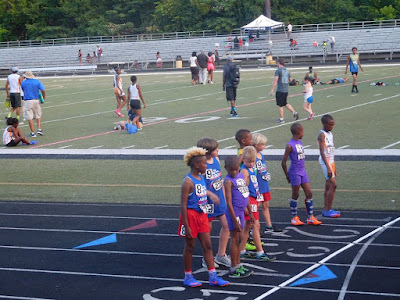 He didn’t have anyone in his age group to run against, but they still lumped him in with all the older kids so as to not make the meet take even longer. He finished with a time of 6:54.95 which was way off his PB from a year earlier. Incredibly, Braden’s last event took place at 7:45 p.m. with the 800M run. 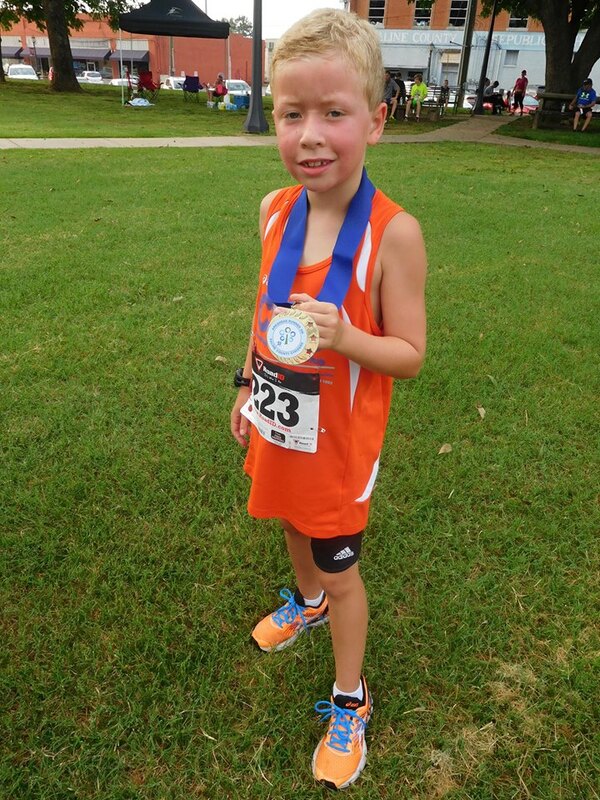 He came in first place with a time of 3:19.33 and once again it was slower than what he had ran the previous year as a 7-year-old. Overall, he took home two golds and one silver medal from the meet, but his track running wasn’t nearly what it should have been, but I chalked it up to him having such a long and exhausting day. Unfortunately, future track events would show that something isn’t right with Braden this season.